We've become accustomed to all this by now, but since not everyone can catch The Daily Show it's become our responsibility to bring it to you: the inevitable takedown of this weekend's ridiculous apology-non apology about the St. Louis Rams doing "Hands up, don't shoot" before their game Sunday. 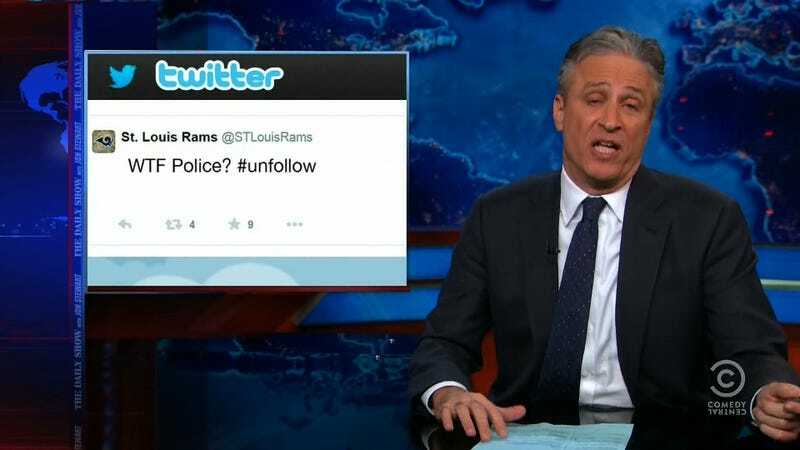 The points Jon Stewart makes are those already explicated elsewhere, but in case you missed it all, there is a vulgar irony to St. Louis County police demanding someone be held responsible for a communication act. St. Louis Cops Declare Rams&apos; "Hands Up Don&apos;t Shoot" To Be "Offensive"